(30/11/15 Available) Is this the start of the radios that will see UHF CB radio legalised inside the EU. It comes soon to the market and Markus Neuner (www.neuner.de) has it coming for €139.90 in his store so keep those eyes pealed and ready to spend the money. UHF Radio Comes 1 stage closer with the release of this and 1/4 antenna. 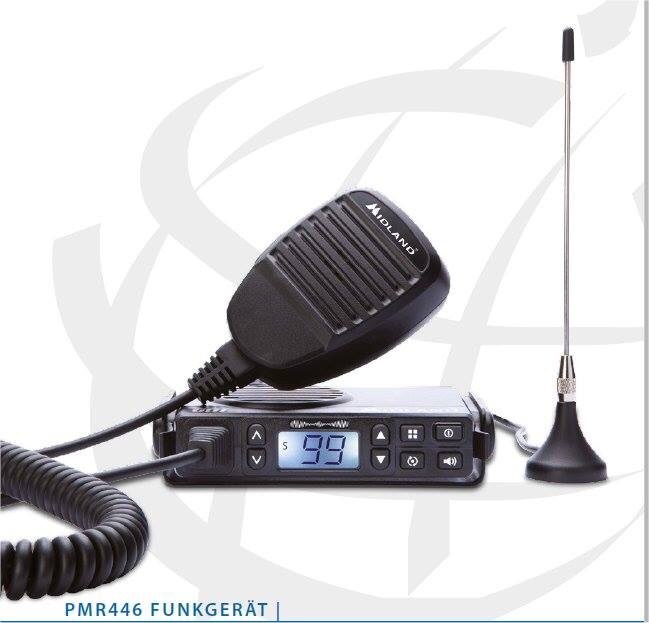 Would be excellent idea as in some areas of EU (not naming country) PMR-446 is used from bases with fixed antennas, mobiles with 5-10w and external antennas and sits side by side alongside the 27mhz CB system so if in anyway these can be expanded (shows channel 99 so maybe can be) then this would fit the bill again just right, needs either 5-10w power and away we go. Guess the modification hunters will attach a connector on the back for an antenna and take away the fitted idea. A very bright future can be for this model if they’ve got it right. A very bright future indeed….. Regarding the Midland GB1, I think it is to expensive. But it may open some doors / minds to the use of UHF CB in EU, as you said. I do like the fact that Midland is making the radio but most probably will not by for that price. @roadhoguk – I follow the CTX gang up there in the UK. although they mainly activate the 11 meters band, they seem to do “a lot” of contacts on PMR446 too. I do not agree that you cant do nothing with 0,5W…The past weekend I’ve made a contact with another PMR446 user, using the Silvercrest Twintalker 4810 from LIDL and the guy was 129Km from me. Yes we were on the top of two moutains, but 129km apart…For PMR446 we have to go out. @Simon – Regarding the QYT KT-8900, where did you bought it ? 409shop.com ? That’s a really good price! I know, but the CTX guys are crazy. Also, I don’t want to find a like minded soul and climb a hill/mountain just to use a bit of radio equipment. Therein lies the problem, how is it ever going to become a CB hobby UHF frequency with those constraints? I’m sitting here listening to a few American stations coming through at 5+9 on 15m and I’m swapping between my 80m (132ft) doublet and my original Avanti Astroplane. I have the 2m/70cm on, with the collinear but that’s a bit dead and the 11m multimode is off, because there isn’t much on today. Later on I will come down the bands, to 80m and then 160m. All in a nice centrally heated house, with nearby toilet, and coffee, food and beer on hand when required. The thing is, 500mw is just not enough to do anything with. Plus on top of that, that aerial is using RG174, which has horrendous loss at UHF. Just look at the chart for loss at 400MHz and PMR is even higher than that at nearly 450MHz. Also, I have a QYT KT-8900 that will give me about 21w on UHF (25w on VHF) and cost me £58 delivered. Yes, I am licensed to use it and at those power levels. I sometimes switch to PMR to have a listen, I have about a 5ft collinear mounted on the house and I hear virtually nothing. I get a weekly email from the RSGB, our national Amateur radio body and two week’s ago, it contained this rather uninteresting document from Ofcom, our governmental communications body. I’ve just ordered a 8900 for €79 delivered. Is it ok or any weird and wonderful things with it? I have found the radio itself good, but the setting up is a little complicated and it is not yet supported by Chirp, although there is a request in and Dan has had the offer of a loan unit. When Chirp supports it, it will be much easier to use. There is factory software, but I haven’t yet purchased the cable, which was about £6 delivered from ebay via China. Some guidance here, well worth reading. A good place to ask questions is here and the owner of the site Miklor posts there. BTW, it is small, very small, but the output has been measured and it does give the specified outputs. It is actually smaller than the Leixen VV-898 that I owned. It would be perfect for mobile, with one of those mini Nagoya aerials that have a magnet the size of a 10p piece, as you could stick the rig in your jacket pocket.